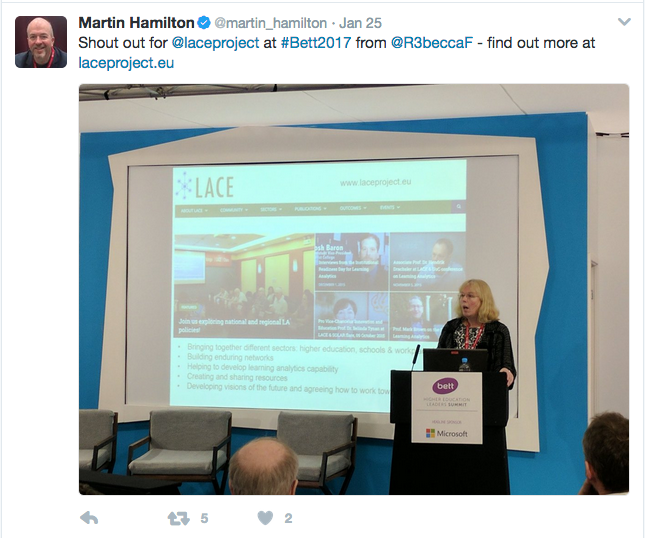 On 25 January, I presented at the BETT trade show on An action plan for learning analytics. If you would like to introduce learning analytics at your institution, where should you start? Drawing on recent studies that consulted experts worldwide, I outlined an action plan for analytics and identified the key points to keep in mind. My talk formed part of the HE Leaders Summit, a section of the event that was designed to address some of the most significant challenges currently facing senior leaders across Higher Education. This entry was posted on March 3, 2017, 9:05 pm and is filed under Analytics, Educational Futures, Esteem, Events, Presentations. You can follow any responses to this entry through RSS 2.0. You can leave a response, or trackback from your own site.